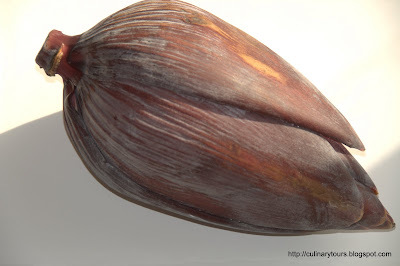 Banana flower is considered a very common vegetable in South India, especially in Tamilnadu state. It has lot of nutritional values and it is used in treating bronchitis, stomach ulcers, diabetes and menstrual problems. It also increases hemoglobin cell levels in the blood. We use almost all parts of the Banana tree. We use the tender innermost banana trunk (Vazhaithandu), Banana, Banana flowers ( Vazhaipoo) in cooking. We serve food in banana leaves (Vazhai Elai). The fiber ( Vazhai Naaru) from the outermost trunk of the banana tree is used as strings to tie fresh flowers and garlands. Banana plant grows from under ground stem called rhizome. After the plant bore fruits, the plant dies and another stem emerges from under ground as a new plant and this process goes on and on for years. That’s why elders bless anyone with the saying “Vazhayadi Vazhaiyaha Vazha Vazhthukkal”, meaning live long like a banana tree. Though cooking banana blossom is a tedious process, the end result is a very tasty and nutritious one. First remove the purple outer cover called bracts and take out the strip of flowers (tiny immature bananas) inside. Keep on removing the bracts until the tough ones are removed. I usually remove till the tip of the flower (very tender cream bract) is seen. Also remove string in the middle that looks like matchstick with a white tip and a rubbery skin with the pink hue. Remove both from each floret. 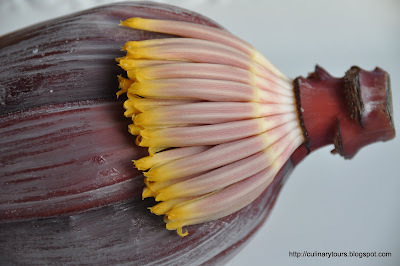 Whenever my mom worked on banana flowers, I and my sister would patiently wait till my mom came to the last part of peeling to get the tender most part of the blossom that can be eaten raw. Chop the florets into tiny pieces. Place the chopped banana blossoms fully immersed in a bowl of buttermilk to prevent oxidization when exposed to air. Pour oil in a kadai and add mustard seeds. Once the mustard seeds splutter, add urad dhal, red chili, hing and curry leaves. Add turmeric to the chopped florets and return the florets to the kadai and give a nice stir. Add salt and cover the pan with the lid. Cook until the florets become soft and tender. Add freshly grated coconut and mix well. Wear a glove when you work with banana blossoms to prevent the sap from sticking on to your hands. You can also add few tablespoons of boiled toor dhal (My mom usually adds it- may be to neutralize the bitterness?) along with the coconut.